We're trying something new in the Worship Artistry Green Room. Maybe I'm old-fashioned, but I'm a big fan of "knowing how to do stuff". Sure, you might have a tuner, but one day that battery is going to die and you better know how to do it by ear. The thorn in the worship musician's side is often transposing. You might have charts in every key, but what if you need to transpose a lick and you run out of frets? (Ripping blues licks through the whole song is not an option). Maybe you practiced that song in G and the worship leader decides to sing it in Gb. You can't just capo onto the 11th fret and play the same shapes. 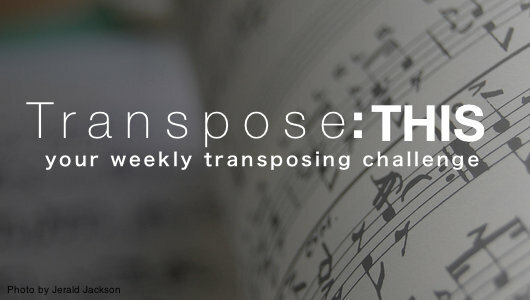 Transposing is a necessary skill that every worship musician needs to have. (Well, not drummers but would we really call drummers "musicians"?). In this series I'm going to challenge you to transpose a particular part of a song to a different key with a specific set of parameters and in next week's post, I'm going to show you how I did it and then create another. You can ask questions in the comments section or offer tips of your own. Practice makes better so let's get to work. We'll keep it pretty simple for the first one. Kari Jobe's "Forever" is in the key of Ab. Let's transpose it to the key of E.
Acoustic players: Transpose the chords. No bar chords or capos allowed. This might be of some use. You don't need to use the same voicing. Get creative. Lead Players: The easy thing to do would be to just shift the riffs down the neck and go open but that's too easy. Play the Verse 2 riff without any open strings. You got this. I'm happy to help in the comments section. Get after it! Epic song with simple chords. Be sure to check out the solo acoustic section. Great one that is super easy to learn. Nice and out front piano for us. That's what I like to hear. New one coming tomorrow.